Local Public Eatery is the fifth and most eastern outpost of this chain of restaurants owned by the Joey Restaurant Group . 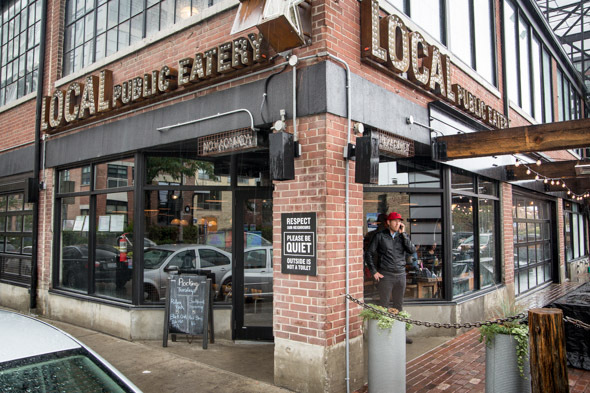 Occupying a lofty Liberty Village corner lot that most recently housed Origin Liberty , the 120-seat pub joins William's Landing and Brazen Head in the neighbourhood. Keeping with the original, industrial character of the area, the interior is open, offering a rec room kind of vibe. 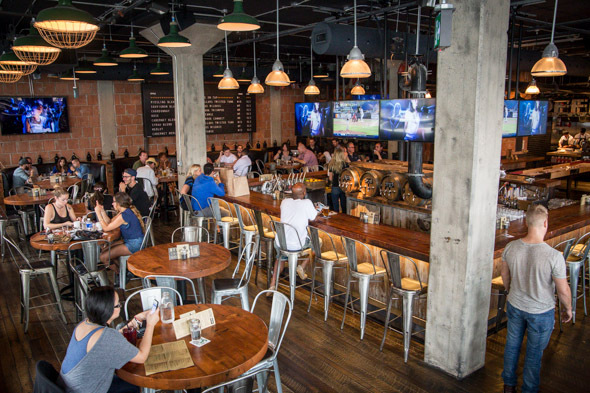 A shuffleboard table and 15 big screen TVs playing sports contribute to the laid-back atmosphere, while a central bar fuels the room and seating for another 60 can be found on the patio. After an initial scan of the menu, what I notice first is what's absent; there's no mac 'n' cheese, no pizza, no heavy pasta entree, and no vaguely-Indian curry dish. Still in the domain of pub grub, the selections take a distinctly west coast approach, with lots of tacos, flat-top seared burgers, and a little Asian influence for good measure. Burgers are pressed thin on a griddle so that the patties are rough around the edges and the surfaces deeply caramelized, crusted on the outside and juicy inside. 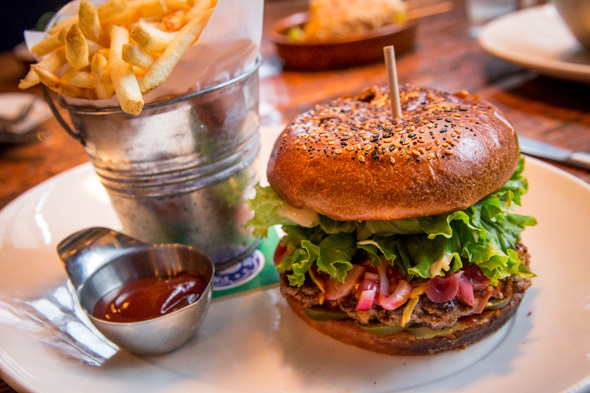 The signature Local burger ($13) comes layered onto a house-baked seeded brioche bun with pickled jalapenos and onions, finely-shredded cheddar and jack cheeses. Fries on the side are essentially the same as at Joey (which are the same as McDonalds, amirite?) and served in a bucket that I'm sure is equivalent to a super-size. There are hearty options like entree-sized salads ($14-$16), sandwiches ($14-$16) and all-day huevos rancheros ($12), too, though the list of starters and shareable plates is the way to go to sample the most variety. 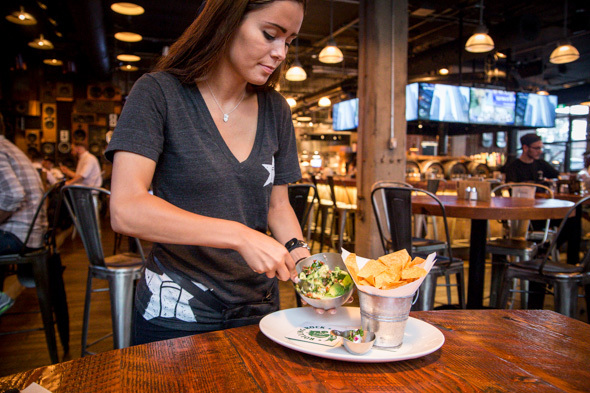 The guacamole in the chips and guac ($6.50) commendably gets mashed tableside, with chopped onions, cilantro and lime added before our eyes. "I've asked them to gets us pestles," confides our server, as she labours to pulverize the soft green flesh with a fork. She doesn't make it look easy, but she does a good job, achieving an optimal creamy consistency. 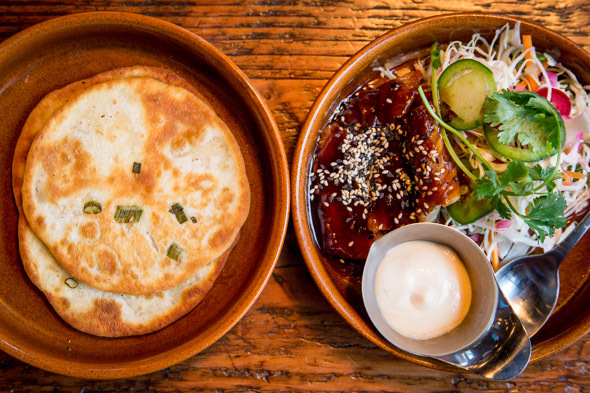 Up next to the table is the crispy pork belly ($8.15) smothered in hoisin sauce and served with firm mini scallion pancakes for self-assembly along with miso mayo, coleslaw and thin shaved rings of jalapenos. I like the dish, but am kind of irked when shareable dishes come in odd numbers - it gets harder to be gracious when it's something I like. 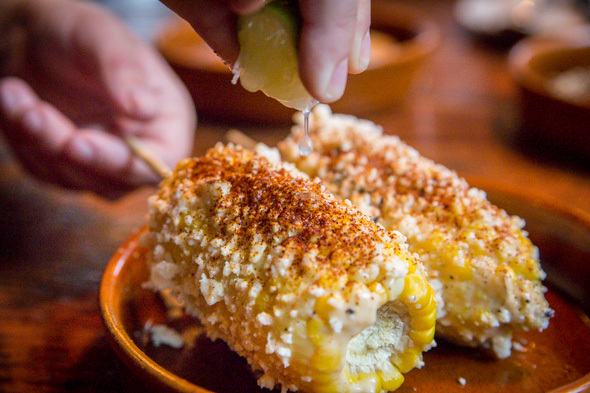 Charred street corn on a cob ($5.50) is skewered and rolled in feta cheese and a dusting of chili powder. Halved for easy sharing, these - along with the crispy salt-and-peppered calamari ($7) - are, by design, driving forces for a thirst that only a tall cold one can quench. 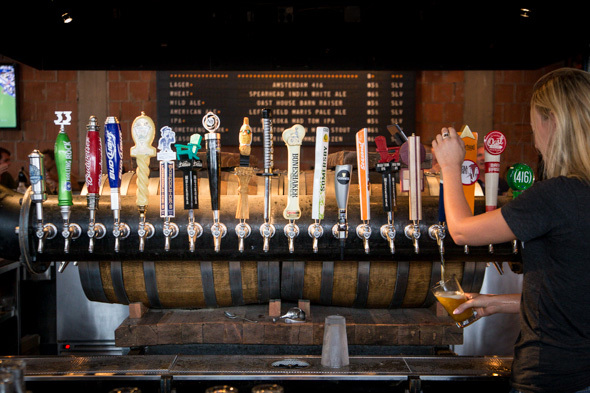 Beer drinkers will find 13 brews reliably on draught, plus seven rotating taps that are advertised on a split-flat display board (a la train station departure board) that also lists what's next on deck once each keg sells out. Those looking for a stiffer drink will find what they're looking for, too. 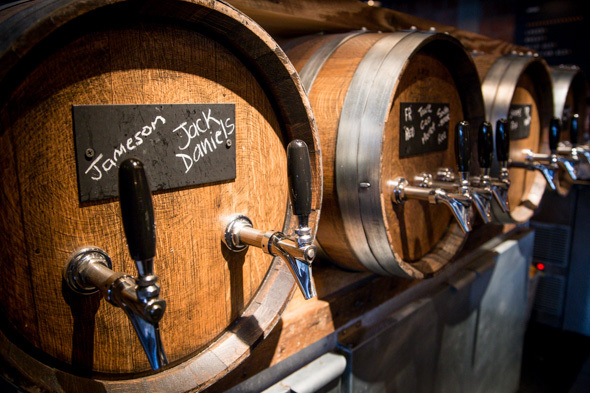 This is a place where Jack Daniels and Jameson flow from a tap ($5.50/oz) and cocktails like the El Caesar ($9) come in a boot. Local Public Eatery is open weekdays at 11am and on weekends from 10am. Each day of the week is blessed with daily drink specials and on weekends and holidays brunch is served from 10am 'til 3pm.